Dementia Care: How Challenging Is End-of-Life Care? When your family member is diagnosed with dementia, one of the things you will be informed with is that this illness is progressing. It means that as the years go by, their condition can get complicated. You might even need some help from providers of senior care in San Antonio, Texas when caring for your loved one with dementia. Aside from the complications; however, it’s also important to keep in mind that dementia will eventually reach its ending. At this point, your loved one will have another set of special needs for their end-of-life care. Consider the following challenges of dementia care in their end of life to help you prepare somehow. Your loved one with dementia will eventually find it difficult to think clearly and remember properly. They may not even reason with you at all anymore. When this happens, they may not be able to tell you what they need help about. With this lack of communication, you might also find it difficult to express your support. After all, when your loved one no longer recognizes you, you might be emotionally overtaken on how you have to approach them. It helps to understand that in the latter years of dementia, the patient’s inability to recognize can be expected. With this mindset, you will hopefully learn to orient yourself in continually conversing with your loved one even when don’t respond anymore. Some dementia patients, meanwhile, can be comforted with touch and hearing senses. Hence, massaging them or playing a soothing music can provide them comfort. 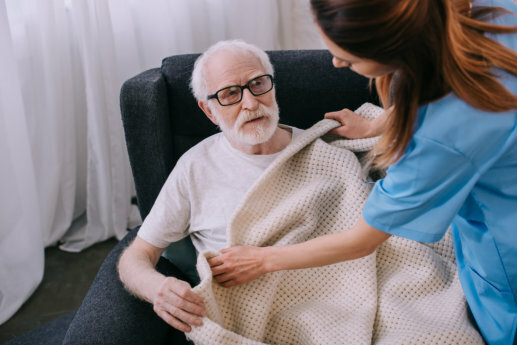 When you face the end-of-life option for your loved one with dementia, getting providers of hospice care in San Antonio, Texas can be helpful in providing quality care to your loved one. These staff members are professionals in dementia care as well as end-of-life care, so you can trust that your loved one will be in good hands. Whenever a medication is necessary for your loved one, they can also make this decision to make your loved one’s condition more manageable. With dementia, the progression can be unpredictable at the end-of-life phase. Your loved one will show more and more signs of physical inability. These include the inability to move or walk around, inability to talk, inability to care for themselves, and even, inability to swallow their food. This form of progression can help the providers of home health care in San Antonio, Texas to verify if your loved one is already in their last stage of dementia. As a family caregiver, you might find yourself facing emotional and challenges in the caregiving responsibility. This is perfectly understandable. Don’t feel guilty when you can think about getting some time off because you actually need it. When you do, our team at Four Seasons Hospice is also here to back you up, providing quality and compassionate end-of-life care for your loved one with dementia, so that you can recover your strength. This entry was posted in Dementia Care and tagged Healthcare, Hospice Care, Senior Care. Bookmark the permalink.